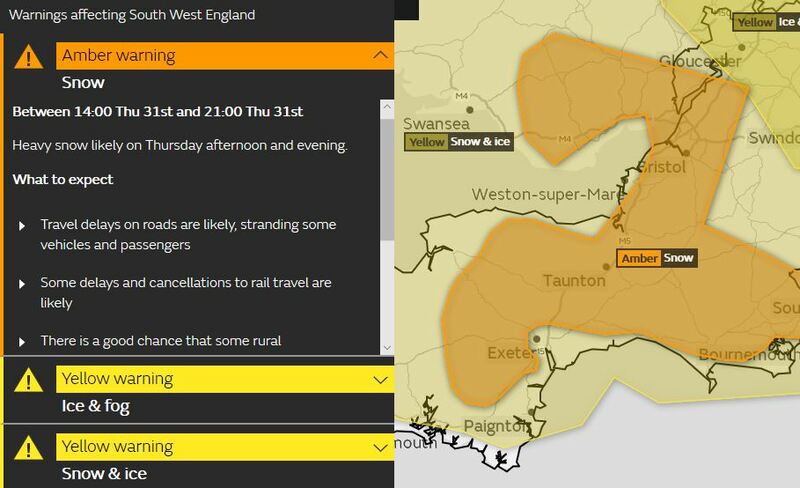 Yet more weather warnings have been issued by Exeter's Met Office. A yellow warning for ice is in force for 24 hours from 1300 today. Devon and Somerset Fire and Rescue has also issued this advice about driving in snow and ice. • If possible avoid driving in snow and other treacherous conditions. • Never leave when it’s snowing heavily or if it is forecast to snow, and avoid in other bad conditions like heavy rain, ice or fog. • If you drive to work, try to make arrangements to work from home (particularly if you live in a rural area). Breaking down is never a pleasant experience – especially if you have to wait for recovery in the cold. You’ll also want your vehicle to be in the best condition to handle difficult driving conditions in severe weather. • Ensure your vehicle is well-maintained through an up-to-date MOT, regular service, and regular walk-round checks by you. • Check your tyres to ensure they’re in good condition and have a tread depth of at least 3mm to be safe in the wet. • Make sure there is anti-freeze in your radiator and windscreen washer bottle. • Keep an ice-scraper and de-icer in your vehicle at all times in winter. • Pack a winter driving kit in case of emergency. This might include: a torch; cloths; a blanket and warm clothes; food and drink; first-aid kit; spade; warning triangle; and high-visibility vest. • Always take a well-charged phone in case of emergencies, but don't be tempted to use it when driving. In severe and wintry weather it's even more important to plan your journey. Check the weather forecast in advance and plan your journey. In bad weather, major roads are more likely to be cleared and gritted, still allow plenty of time for potential hold-ups. The Met Office provides up to date forecasts, and issues warnings when severe weather is likely. Clear ice, snow and condensation completely from your windscreen and all windows before setting off. Clear snow off the roof of your vehicle too, as it might fall and obscure your vision during your journey. • If you do get caught in bad weather, follow these steps to minimise the dangers. • Use lights accordingly – fog lights in foggy conditions, dipped headlights when visibility is reduced etc. Keep listening to the radio for traffic and weather updates. On motorways, look out for overhead message signs where the Highways Agency will flash up important travel messages, including warning you of delays and advising of alternative routes.